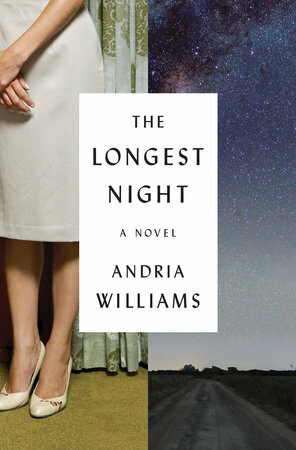 Andria Williams’ debut novel The Longest Night is a book about many things—the Cold War, the American West, gender roles in the 1960s, the birth of nuclear power—but above all it is a portrait of a marriage and the forces that challenge it. I was immediately drawn into the story by the opening scene of the novel—a man named Paul, racing through the night on a rural road, passing an ambulance and fire trucks that are rushing away from an accident that he is driving towards. What is taking him there, compelling him to put himself in terrible danger? Who is he trying to save? Before we can get answers to this question the novel flashes back to a blindingly hot summer day, three years earlier. A young family are driving cross-country from Virginia to Idaho Falls, where the husband, Paul, has been stationed for his next army tour. They stop at a lake in northern Utah where local teenagers are diving from the rocks. The wife, Nat, is desperate to cool off, and leaves her one and three year old daughters while she climbs to the top of the cliff and dives in, fully clothed. When she emerges from the lake Paul is furious—embarrassed, ashamed, scared she could have hurt herself. But as a reader, I was fascinated. I wanted to know what Nat was looking for in that moment of freedom. Did she just want to escape the demands of being a wife and mother for those brief seconds? Did she want to show her husband that she was her own person, still? Did she want to set an example of fearlessness for her daughters, or was she not thinking of them at all? When I describe Andria’s novel I often say that it reminds me of Revolutionary Road, if such a book were set in the American West. That is to say—it is a story about frustrated ambition; domesticity; the stifling social norms of a small town, ruled by a cabal of wives who never fail to match the color of their centerpieces to the tablecloths. Yet it is also a story about how love changes in a marriage—how it is shaped by distance and separation; the birth of children; by our challenges in reconciling our adult selves with our adolescent ones. It is a story rooted in a uniquely specific time and place, that is utterly universal in its implications. I hope you will enjoy reading it.